Marcus Salvia produces deep purple flowers that bloom from early to midsummer. It is covered with deep green foliage and this plant is highly aromatic making it a great plant the deer dislike. It will grow to a height of 10" to 12" tall and 12" to 18" wide. Plant Marcus Salvia in full sun and well drained soil. Marcus Salvia attracts hummingbirds, butterflies, and bees when in bloom. 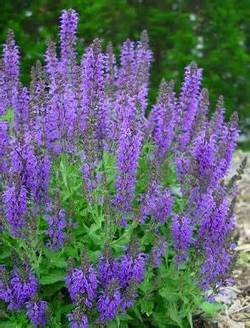 Use Marcus Salvia as a border plant, massed in a perennial garden, in a Rock Garden or a Cottage Garden. It makes a great cut flower and will do well in containers. It will become drought tolerant once it is established. It also makes a great groundcover!